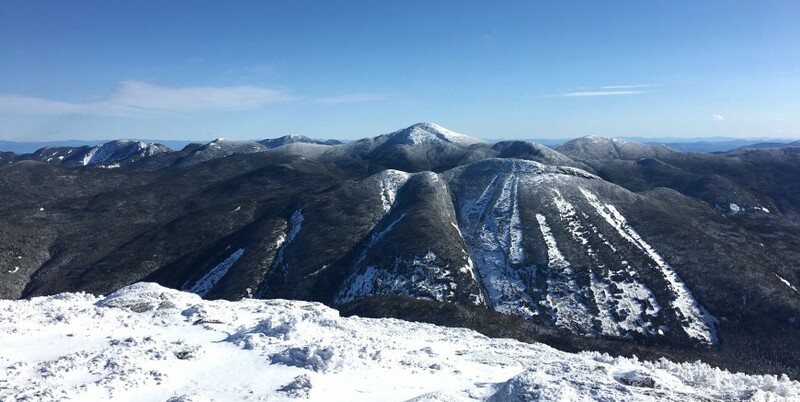 Hiking this peak begins at the Van Hoevenberg Trail, which is the same starting location for Phelps Mountain, Wright Peak, Mount Marcy, and other popular hikes. The trail begins by descending, and then remains relatively flat until a junction .9 miles in. To the left, the Van Hoevenberg trail continuous towards Mount Marcy, to the right is the path towards Algonquin, Wright and Iroquois Peak. 2.9 miles into the hike, you will reach the junction where hikers can choose to ascend Wright Peak (.4 miles from junction) or Algonquin (.9 miles from junction). At this point, the hike gets challenging due to steepness, and hikers quickly ascend above treeline. Algonquin peak is frequently hiked in conjunction with Wright Peak, and Iroquois Peak (both Adirondack 4,000 footers). Algonquin peak is a fantastic winter hike. It is a long and strenuous hike, and features quite a few steep and icy sections, so it is only recommended in the winter for experienced hikers. It features a large amount of exposed hiking above tree-line, so it is essential to bring the proper winter hiking equipment. The trailhead is located at the end of Adirondack Loj road next to heart lake, and has a fee. Members of the Adirondack Mountain Club receive parking discounts.